Ben Guerrero has penned a story for Recycling Product News ‘The Risks of Not Staying on Top of Shredder Maintenance.’ Survival in times of low markets dictate many cut backs in shredding facilities worldwide. When you are low on people, finding man hours to tackle even the most basic maintenance is a challenge. Ben outlines some of the do’s and don’ts in this article. While it may be ‘preaching to the choir’ for operators, this simple advice should be acknowledged by senior management. Shredders and non ferrous separating systems won’t keep running without minimum maintenance. Idled plants won’t start up or hold much resale value if they are ‘put away cold and wet.’ Deferring too much maintenance could lead to larger issues. Failure to clean the motor air cooling system filtration leads to dirt build up in the windings. Warmer operating days lead to high motor temps, then overheating and a motor fire. The cleaning crew continues to defer cleaning the spillage that slowly builds up between the shredder and motor building. Your inspectors miss an auto with fuel in the tank. Fuel runs out as the auto slides down the infeed chute, it trickles down next to that scrap pile, and there is ignition. A fire right next to your mill machinery now needs attention. Extending runs times between grate changes saves part costs. 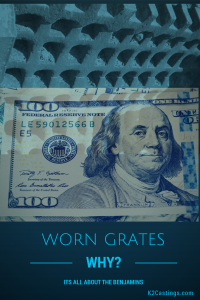 Eventually grate holes are 30% larger than new, the distance between hammer tips and anvils is large, and cream puffs of balled up sheet drop from your stacker instead of dense shred. Your fluff loads have more metal than you remember. You check the last 3 months of production records and realize your non ferrous recovery has dropped noticeably. Ferrous production is up but shipping density is down, zorba volume is down, and so is revenue. Was it feed stock, weather, or maintenance? Compare the savings in wear parts to the revenue decline. What’s the best balance? The answer is different for each plant. Safety and environmental compliance are non-negotiable operating absolutes. Operating maintenance is not too far behind. Ideally it’s all the same mindset at your facility, and peak performance and efficiency continue to be the goal of all team members. Yes, there must be rational tradeoffs between budget, readiness, and acceptable downtime. Plan in advance to be ready for seasonal or market upticks in volume. Be sure your facility stands ready to execute for a return to higher production when opportunity arrives. Find Ben’s article Recycling Product News – Ben Guerrero.